A popular football coach and tree surgeon who was found hanged 40ft. up a tree took his own life after a number of pressures conspired together. Father-of-two Mr Neil Kennerley (44) was found on August 17th “at a considerable height” up a tree in the grounds of the former Habergham High School in Kiddrow Lane, Burnley, just 500m from his home. 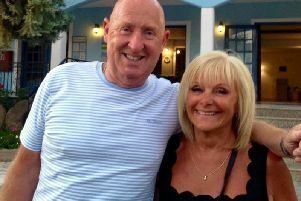 An inquest at Burnley Coroner’s Court heard from his partner of 22 years Mary Reid who said concerns about a back injury, as well as worries about his job and home had made him very unhappy. Mr Kennerley, who was the coach of Belvedere Boys under 8s team, had injured his back following a fall at work in July. Miss Reid said: “Neil’s GP had prescribed him painkillers but he went back a second time because he was still in pain. “He was asked to go for an X-Ray and convinced himself it was something more serious. He began to research on the internet and became more and more concerned. The inquest also heard that Mr Kennerley had spoken to his eldest son Nathan around midnight on the night before he went missing when he declared he had “had enough”. Nathan confirmed he taken his car keys from his father. X-Ray results had shown that Mr Kennerley had a degenerative change in his spine, but it was not life-threatening. Pathologist Dr Deepa Jacob, who conducted the post-mortem examination, gave the cause of death as hanging. Toxicology tests showed a small amount of alcohol in his system. Police confirmed that three cans of lager were found nearby when Mr Kennerley was discovered by an officer. Miss Reid told the inquest she had first believed her partner had slept downstairs but became concerned when he was missing on the morning of Tuesday, August 16th. East Lancashire Coroner Mr Richard Taylor recorded a conclusion of suicide. He said: “Events like this can never be anticipated. We all have the gift of hindsight. “Neil took his problems seriously and personally. He was concerned about his back, his future employment and accommodation. A minute’s applause was held at Turf Moor in his memory.